As mentioned in J Man's thread on hazel eyes, I am pleased to announce my project on eye colour genetics is active once more. For those who are unfamiliar with it, or wish to learn what happened to the project since its' inception, please view the Spoiler below. The project began in the Autosomal DNA section of the now defunct DNA-Forums in the first half of 2010. As more users became interested, the general aims of the project took shape. The initial focus was on the HER2 and OCA2 genes, both of which are browsable in a 23andMe customer's raw data. This was expanded to include additional loci, such as SLC45A2. At its' peak, the project contained 60 distinct genotype strings based on 16 handpicked SNP's taken from the literature of the time. These were stored on an offline spreadsheet on my hard-disk. Unfortunately, a set of computer problems resulted in the data being inaccessible in May 2011. I managed to retrieve most of the data from their original sources (PM's and posts). The final blow to the project came with the demise of DNA-Forums. The community scattered across various other forums and I have not encountered quite a few of them since online. As the project was entirely derived from DNA-Forums members, it was inappropriate and against my own principles to continue using personal genome data from kind participants without their continued knowledge, regardless of the small number of SNP's used. Several users here on Anthrogenica were participants in my project. I have listed all previous participants below. If those users could kindly inform me (publicly or privately) whether or not they are interested in remaining in the project, that would be much appreciated. All data belonging to previous users who haven't made contact will remain unused indefinitely and in their entirety. I should also take this opportunity to state that, if sufficient users (at least n=50) are participating by August 15th 2013, it is my intention to formally write up and publish the results and subsequent analysis (for more information on this please view "Project Assurances and Terms" below). Participation in this project is therefore automatically taken as unwritten permission to include your eye colour SNP's for my research. This was stated toward the end of the original project and remains the case now. Which SNP's predominantly control brown vs. light eye phenotype. Which SNP's for the cohort are involved in additional variation. Successfully predict the phenotype from five examples of genotype data. Contrast with existing conclusions in several studies. Whether 23andMe's standard v2 chip has the capacity to support more detailed eye colour prediction assays. Search your 23andMe Raw Data for all the SNP's in this panel (currently accessed by logging into your profile, highlighting the cogwheel on the top left hand side, selecting "BROWSE RAW DATA"). List your SNP genotypes in the order shown in the panel. Modified and taken from Beleza et al. 's Genetic Architecture of Skin and Eye Color in an African-European Admixed Population and Ruiz et al. 's Further development of forensic eye color predictive tests. Share the essential data (genotype and phenotype information) with the project creator (myself, DMXX) either publicly on this thread or privately by PM. Participants are sent a unique ID (IDnnn) by PM to confirm their information is stored on an offline spreadsheet. Receive deeper analysis into genotype data provided from markers validated in current scientific literature. This will be delivered via an online spreadsheet which differs from the offline hard copy. In it, user ID's are listed alongside the inferences made from their genotypes. Opportunity to discuss findings or queries concerning the inheritance of eye colour via personal data. Real-time updates concerning what the project has discovered and how this relates to you. All communications and data between the project creator and participants (user ID's, genotypes, pictures) will remain confidential unless users choose to publicly post these. At no point will user data of the sort described above be passed onto third parties. Incomplete participant information (i.e. half of SNP genotypes, no picture/description) will not be included in the project. If a formal report is composed, no personal genotype data or user ID's will be published. The only planned exception will be of the five predictions from genotype data. If I feel any of the pictures are worth including in the report, I will seek permission from those who provided them. Updates on findings will be posted in this thread only. It is worth stating that eye colour genotypes are highly unlikely to convey sensitive information concerning health traits as they tend to come from genes which regulate pigmentation. The first version of the project also revealed that a partial distinction between West Eurasians and other world groups could be gleamed from eye colour genotypes in a rudimentary and non-specific manner. Therefore, it is also highly unlikely any specific information pertaining to ancestry will be inferred. As unlikely as it is, any changes made to the project's methodology or approach will be announced here. Will be completed in the next week. Please feel free to use me and my family at your leisure. EDIT: Hmmm, I thought we were in it, but I don't see the names in your second spoiler. Do you want data? Updated with the SNP panel and a guide to use when giving your phenotype descriptions if a picture cannot be produced. Last edited by cavergal; 07-06-2013 at 06:16 PM. 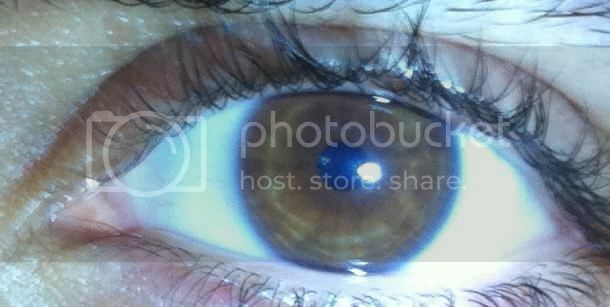 Eye color: Dark brown, I think. Sorry about the poor quality, but I had to take the pic in the bathroom with my cell phone. Going by that color scheme, I guess mine counts as either Inter-light or Green-hazel? Last edited by linkus; 07-07-2013 at 01:59 AM. I'd actually say both you and your mother belong to the "Inter-light" category because there's evidently some blue pigmentation which the "Green" category seems to lack. I imagine some of the uncertainty concerning your own eyes stems from differing resolutions; all sorts of interesting patterns can be observed in human eyes up close. Those photos provided in the study, however, clearly aren't as detailed. Even from a distance, however, your maternal grandfather's eyes are clearly a uniform blue.